PANIC, party time then planning mode. 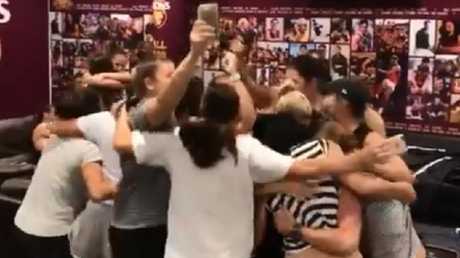 The Brisbane Lions rode an emotional rollercoaster on Sunday that finished with the club qualifying for its second-straight AFLW grand final. The Lions will take on the Western Bulldogs in the 2018 season showpiece at Melbourne's Ikon Park this Saturday after Collingwood upset Adelaide to hand Brisbane a shot at grand final redemption. * The Lions needed a big percentage-boosting win over GWS on Friday night. Check. * The Bulldogs needed to beat Melbourne on Saturday. Check. * And the Magpies needed to beat reigning premier Adelaide. Check. The Crows were well on top at halftime but added just two behinds in the last two quarters as Collingwood cruised to a 21-point victory. The final siren sparked euphoric scenes at the Gabba where the Lions players had gathered to watch the match that would decide their fate. But celebrations quickly gave way to getting ready for the chance to make amends for last year's grand final loss to the Crows at Metricon Stadium. 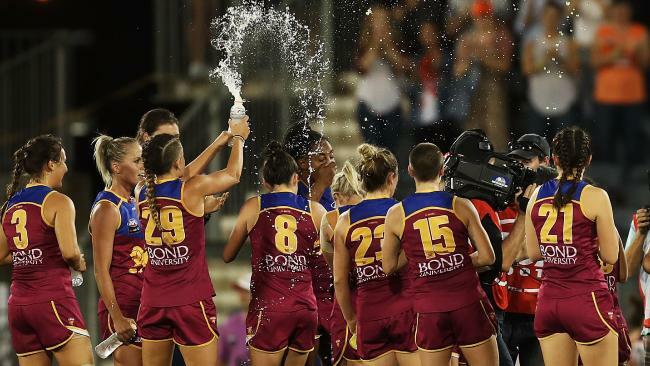 Brisbane players celebrate after making the AFLW Grand Final. "I rode every bump, tackle and mark. I was very, very, very nervous watching that. My anxiety levels were going through the roof,'' Brisbane captain Emma Zielke said. "There was a bit of yelling and screaming at full-time but I've clicked into preparation mode now and am really focusing on the week ahead. Zielke feared the chance to make the decider was all but lost when the Lions fell to Collingwood last weekend. "Yeah, definitely. I felt flat for days after that game. I genuinely thought we'd blown the chance to get to the grand final,'' she said. Lions coach Craig Starcevich said Brisbane will learn from last year's grand final campaign when the squad and coaching staff reassemble on Monday. 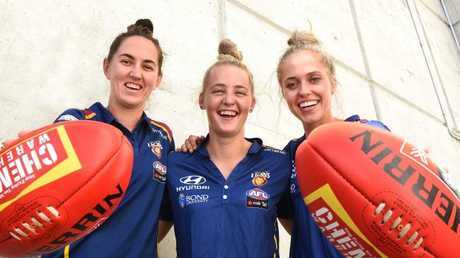 "All the girls are pretty excited at the moment but we will quickly get into how the week unfolded last year and what were the learnings from that week that we can apply this time around,'' he said. "We'll try to keep it as normal as possible and stick to our weekly routine. "By the time the siren sounded I'd had the chance to process things and I was into planning mode for the week. Starcevich won a flag as a player with the Magpies in 1990 and was happy to see Collingwood fly home against the Crows. "There was a little hope for us and I felt like we had lost an opportunity last week. Collingwood made things really difficult for us by beating us last week but they proved they are a good team that has come good at the back-end of the season and they did us a favour against the Crows,'' he said.